Leading innovator and provider of network storage solutions, Asustor NAS announces that it has integrated with well-known camera brand AVTECH. Asustor NAS offers comprehensive support for AVTECH’s Push Video IP camera series including the newest AVN813 and AVN701 models, providing a convenient mobile surveillance and storage solution. After setting up their surveillance systems, Asustor users will be able to receive instant push notifications on their mobile devices in the event of any disturbances, allowing them to closely monitor the latest developments. All Asustor NAS devices come equipped with Intel Atom dual-core processors, combining supercharged performance with low power consumption, making it an optimal platform for constructing surveillance systems. Asustor’s App Central enables users to freely browse, download and install unlimited NAS Apps, creating a customised NAS device for themselves. Surveillance Center, one of Asustor’s in-house developed Apps allows users to easily set up their own surveillance system by enabling the App in App Central to receive 4 free IP camera channels. Surveillance Center features a web-based interface that allows users to easily monitor cameras, execute real-time recordings, schedule recordings and playback video. The event notification feature can be configured to notify Asustor users of any disruptions, allowing them to keep track of the latest critical developments. Announcing the compatibility of AVTECH’s IP camera product line with Asustor NAS devices, Andy Lee, Marketing Director at AVTECH comments that AVTECH is a high-quality surveillance solution with the latest innovative features including instant video notifications (Push Video) via mobile devices. James Su, Product Manager at Asustor adds that the integration will provide an excellent surveillance solution combination that will allow users to take full advantage of mobile cloud computing while also being able to enjoy Asustor NAS’s signature reliability with regards to storage and backup. 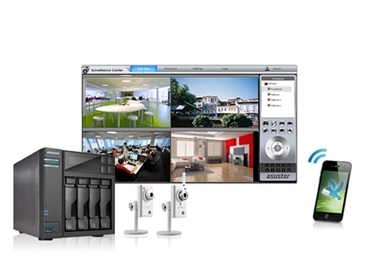 A leading innovator and provider of private cloud storage (network attached storage) and video surveillance solutions, Asustor NAS currently supports over 100 different IP camera models from renowned brands, giving users more options than ever before to create a customised and reliable surveillance solution.